JOE GALLEN believes Ronan Curtis can earn a call-up to the Republic of Ireland senior squad. But Pompey’s assistant manager has told the forward to remain grounded after his rampant start to the season. Curtis has hit the ground running at the Blues following his arrival from Derry City in June. He’s registered five goals and three assists, swiftly endearing himself to the Fratton faithful. Curtis is currently away on international duty with Ireland’s under-21s for their European Championship qualifiers against Kosovo and Germany. On Friday, he rescued the Boys In Green a 1-1 draw in Kosovo with a superb solo effort. It meant the 22-year-old missed Tuesday’s Checkatrade Trophy win over Gillingham and yesterday’s clash against Shrewsbury Town. If he continues to perform at a similar level, Ireland manager Martin O’Neill will no doubt take a closer look at Curtis’ progress. Although he’s plying his trade in League One, Gallen feels it may not hamper the attacker’s chances of winning a spot in his country’s senior squad. Kenny Jackett’s right-hand man said: ‘They obviously know about him. ‘If we manage to stay on a good run and Ronan continues to stay in the team – let’s not forget we have got Andre Green from Aston Villa who’s come with a lot of plaudits and rave reviews – who knows how it is going to end. But why not? ‘I’m not too sure what their perception of League One is. ‘When gauging it when talking to players in Ireland, they see the Premier League and Championship higher than the League of Ireland. ‘I’m not too sure where they see League One. ‘They might feel their own league is somewhere but it’s not for me to say. ‘Overall, I think they will look at the Championship and above. 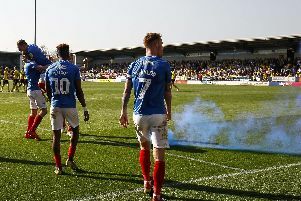 Gallen admitted he did not expect Curtis, who was shortlisted for August’s League One player of the month, to make such an instant impact at the start of his Pompey career. But the south London-born talent has been warned he must remain level-headed having only played six Football League games so far. Gallen added: ‘He feels pretty unstoppable at the moment and his confidence level is high. ‘He’s taking free-kicks and wants to take the corners, which is great. ‘But what I’d say to him is it’s feet on the ground time and to relax. ‘I did think he would be good but didn’t expect him to score five goals. ‘It’s great and is going to help him. ‘The boys love him and I’m sure the fans love him as well. But, let’s be honest, he’s six games into his Football League career and that’s not many. ‘He’s made a really good impression so far and I really hope he keeps going. ‘He’s six games into hopefully a really long career for us.